Godfrey Evans was one of the greatest wicket-keeper of England. He was the first to make 200 dismissals in Test cricket. He played first-class cricket for Kent with a very long career. Know more about this player in this article. Godfrey Evans was an english cricketer played as a wicket-keeper batsman in the team. He was one of the most successful wicket-keeper of his time having taken more than 200 dismissals and the first to do so in Test cricket. Evans was born in Finchley, Middlesex on 18 August 1920. Early Career: 1939-1949 Godfrey Evans made his first-class debut in 1939 playing for Kent against Surrey. After Second World War in 1946, he was called in the England team for the home series against touring India. He played in the third test of the series where he didn't get chance to perform on a rain effected match. On tour of Australia in 1946/47, Evans played in four tests with a little contribution in the batting but impressed with his wicket-keeping taking 9 dismissals. The same year when South Africa toured England for five-test series, he played in all the matches. In the first Test he made a quick 74 runs to help England draw the test after following-on. He also did a stumping and took a catch in that match. In the fifth and final test he made good contribution with the bat scoring 45 and 39* in the match. He was brilliant behind the wickets taking five dismissals in the match. England won that series by 3-0. 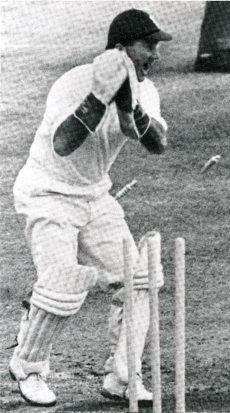 During the tour of South africa in 1948/49, in third and last test Evans did three stumpings in the match. 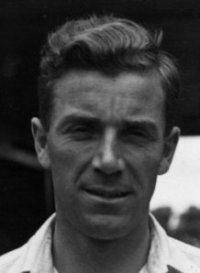 Evan's first hundred came at Manchester in 1950 against touring West Indies team in the first test of a four match series. He made 104 runs in the England's first inning. He was also good behind the wicket in that match and made three stumpings. He made played a 63 run innings in the third test. In 1952 against touring Indian side he was in top form when he scored 242 runs in four matches with an average of 60.50 which includes his second test century of 104 runs at Lord's Cricket Ground in second test. Evans remained a regular member of the England team throughout his career. He played his last test against India at Lord's where he was out without scoring any run in the only inning of the match. He ends up 219 dismissals in Test cricket which was a record at that time. This also includes 46 stumpings, which is second most by any wicketkeeper till now. Evans played for Kent in English domestic cricket throughout his career. He is among one of the 25 wicket-keeper who has more than 1000 dismissals in first-class career. His batting record in first-class also good. He has scored seven first class centuries. This article is about the famous english cricketer and allround cricketer Wilfred Rhodes. Here is given the profile, first class cricket career, international career, cricket record of this great player and the Oldest Ever Cricketer in Test Cricket. This article gives you complete information about Jonathan Trott, ICC cricketer of the year 2011. More details about the profile, biography and career records of Jonathan Trott is also quoted in this article. This article gives you complete details about Alastair Cook, who is the current captain of England ODI team. Morfe details about the biography, profile and career records of Alastair Cook is quoted in this article. 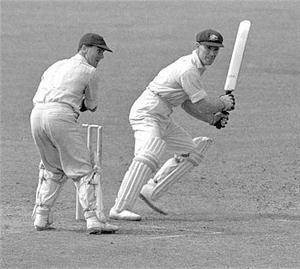 This article is about one of the greatest opening batsman from England - Herbert Sutcliffe, who has represented England in 54 Tests. Here is given the profile, career and records of Herbert Sutcliffe who also has a very good first-class record.